Look to the Lansky 2-Rod Turn Box Knife Sharpener for a versatile two-stage knife sharpening system that fits easily inside a chef's drawer, a fisherman's tackle box or outdoorsman's pack. Made of solid hardwood, the turn box includes two preset sharpening angles to provide the sharpest edge on various knives. For fine sharp edges, the 20-degree setting provides the best results, while generally requiring more maintenance. The 25-degree angle is suitable for most kitchen knives and provides a longer lasting edge. 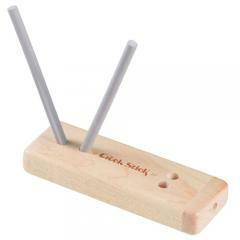 The knife sharpening set includes two alumina ceramic sharpening rods of medium grit. The rods conveniently fit inside the compact box for safe keeping and years of service.